Petty Officer 2nd Class Vera Turner is reunited with her son, Steven Turner Jr., at his high school graduation in Tuscaloosa, Ala., May 23, 2015. 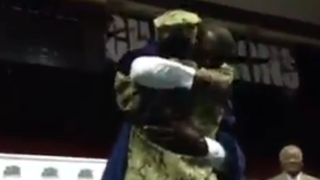 It was the best graduation present ever for a son who hadn't seen his mom in many months. Petty Officer 2nd Class Vera Turner surprised her son, Steven Turner, Jr., at his high school graduation in Tuscaloosa, Ala., Saturday. The 16-year Navy vet returned home after a nine-month deployment at Guatanamo Bay, Cuba, according to AL.com. The school was in on the surprise, but even Turner's husband and other children weren't aware that she would arrive in time for the ceremony. The school deliberately put Steven last in the diploma line, and his mother was hiding offstage until the moment her son's name was called. The mother-and-son hug, which lasted a few minutes, brought tears to the eyes of many of those in attendance, who responded to the surprise with thunderous applause. According to the website, Steven is a solid student who has earned a scholarship to Alabama A&M, where he plans to major in electrical engineering.